On March 24, 2017, students, faculty, and staff gathered for the second annual MUIH Research Symposium, an event that highlights the best of the University’s research and scholarship. Two symposium awards were given and Dr. Michael Tims, Academic Director of Herbal Programs at MUIH, was recognized for winning MUIH’s second annual Excellence in Research and Scholarship Award. Read a recent interview with Dr. Tims and learn more about his innovative work here. The center-piece of the event was a poster session displaying recent research from the MUIH community. Students, faculty, and alumni submitted abstracts and were chosen to present through a peer-review process. To see this year’s posters and abstracts click here. James Snow, M.A., RH (AHG), Assistant Provost for Academic Research and Academic Director for Integrative Health Sciences, kicked off the event by providing an update on research activities at MUIH. Download his presentation here and read more about the importance of evidence-based research in a recent interview with James Snow here. Dr. Belinda Anderson, Associate Clinical Professor at Albert Einstein College of Medicine (Einstein, NY) and Academic Dean at Pacific College of Oriental Medicine (PCOM-NY), presented the keynote address. 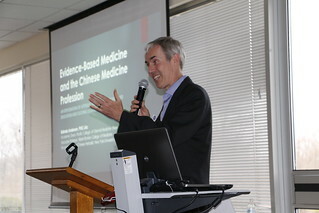 Dr. Anderson’s presentation, titled “Evidence-Based Medicine and the Chinese Medicine Profession: An Exploration of Attitudes and Beliefs in Relation to Education and Cultural Change,” described research that has been undertaken at Pacific College of Oriental Medicine through a 5-year NIH grant. Watch the presentation, and download the presentation slides here. Dr. Tims also gave a presentation of his work on “Design, Development, and Implementation of Two Student-assisted Research Studies.” Watch the presentation, or download the presentation slides here. The faculty Research Poster Award was awarded to Daryl Nault, M.S., adjunct faculty member at MUIH presently teaching research literacy and statistics, for “Cross-Sectional Analysis of eHealth Literacy Characteristics within Herbal Supplement Users.” To learn more about the award-winning research, read an interview with Daryl Nault. The student Research Poster Award was awarded to Ronald DeMartin, Marion Bolding, and Abbi Lichtenstein, for “Design for a Study Exploring Individuals’ Attitudes of Health and Wellness Coaching.” To learn more, read an interview with the student research team here.